There's a lot happening in the fashion world at all times. They don't say "fashion never sleeps" for nothing! It seems as though every week there's a new designer or trend to know about, and frankly, it's overwhelming. Today, we're here to let you in on the brands we've been bookmarking so far this year. While they might not all be brand-new, they certainly are under the radar enough to feel fresh, and this year, that's what we're craving. High-end designers and cult-classic brands are easy to follow, but it's niche brands like the ones ahead that make our eyes widen larger than usual. Maybe it's the idea of being the only one in your friend group to own said product, or maybe it's the rush you get from supporting an up-and-coming designer—either way, it's a feeling. And I don't know about you, but when I shop, I like to feel something. I prefer emotional purchases over stagnant ones, for those are the items in my closet I end up treasuring the most. Out of the 20 designers and brands ahead, I can promise you you'll feel "some type of way" over at least one handbag, shoe, or pair of statement pants here. Ready to learn all about the brands we're ready to take the fashion world by storm this 2018? We11Done, standing for "well done, well made," was a brand that used to only be found in the iconic Korean store Rare Market—that is until Net-a-Porter started stocking the label. Designed by Dami Kwon and Jessica Jung, the owners of Rare Market, We11Done is the brand to head for when you're craving necessary basics with a cool-girl twist, including the perfect oversize tees, easy-to-wear coats, and more. We first spotted this eye-catching shoe brand on one of our favorite fashion girls, Maria Bernad, and instantly had to do some investigating. Salondeju is a shoe brand for those of you searching for that pair you can't find anywhere else. Each style from the boots to the heels contains a detail that sets them apart and makes for great Instagram content along the way. We have to warn you though, choosing a color in any of the styles will be a difficult task—so brace yourself because they are all swoon-worthy. Created by Mozhdeh Matin, Mozh Mozh is a brand dedicated to working with artisans whose intentions are to protect and respect Peruvian textiles and techniques to produce the luxury products that they do. The designs are clearly rich in culture and cater to the fashion girl craving some risks. Come here for festive bags, exciting colorways, and, thanks to the spring collection, delicate crocheted pieces. We were curious about Stand before, but this past Stockholm Fashion Week confirmed our hunch that this brand is about to be huge. Best known for its assortment of statement-making outerwear, Stand finds inspiration "in the French feminine effortless chic aire, with an iconic Scandinavian simplicity and purity to every garment," the site tells us. 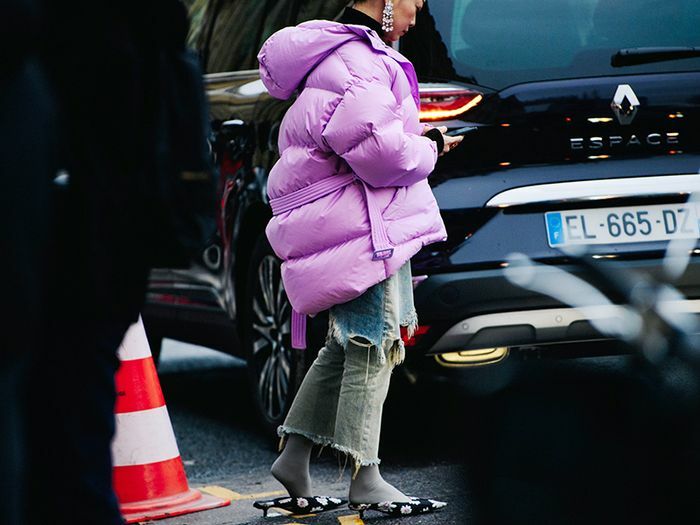 Up-and-coming influencers like Maren Schia and It girls like Blanca Miró Scrimieri (just to name a few) showed off Stand's outerwear recently, and we are extremely on board. Liudmila is proof that if you want your daydreams to turn into a reality, they absolutely can. While listening to a lecture on the Russian novel The Petty Demon at Wesleyan University, Najeeba Hayat decided the government/management consultant path she was on wasn't for her—but shoe designing was. The line is named after a character in the novel, and the designs show the whimsical emotion Najeeba experiences not only as a lover of literature but as a remarkable shoe designer. "Born from the curiosity to explore the constant rivalry between the raw and the elegant," as the site so eloquently describes, Aalto is a brand for the cool fashion girl if we've ever seen one. Based in Paris, designer Tuomas Merikoski is known for blending French-girl style with the rebellious nature of the youth, and if you ask us, he does it quite perfectly. Paris 99, although having just launched a couple of weeks ago, is a kitschy dress brand quickly gaining steam and approval from the fashion community. Currently stocked on Opening Ceremony and the Paris 99 site itself, designer Paris Starn set the intention of her line to directly put the wearer's confidence on display while taking massive inspiration from her grandmother's aprons—the ones she used to bake in as a child. Whether you're looking for a fresh new party dress or simply want a nostalgic piece of something special hanging in your closet, Paris 99 is the place to start. Ready to fall down the rabbit hole? Because Elenareva will take you to there in seconds flat. The Ukrainian luxury label describes itself as "contemporary couture with the arty twist" and its spring 2018 collection was exactly that. If chic and unheard of styling techniques are what you're in search of, we suggest you turn to Elenareva's latest collection for you'll find innovative layering techniques, fresh tailoring, and a few other sartorial surprises along the way. Our love for Susan Alexandra has only grown since our discovery of her brand this past summer. Maybe you've started seeing her adorable handmade beaded bags all over Instagram (thank you, influencers), or maybe this is your first time hearing of the brand, but either way, we couldn't write this story without including her. In addition to bags, Susan designs funky jewelry as well as her recent addition, hair bows. Click through her Instagram and you'll fall in love if you aren't already. It's no secret that we love a good under-the-radar swim brand here at Who What Wear, and this one in particular has our curiosities at an all-time high. We first caught wind of Oséree when Patricia Manfield posted this adorable video in one of the brand's bikinis, but its new collection is what reminded us just how much we were intrigued by the brand in the first place. This summer, we're predicting It girls all over will be sporting these glittering confections, and frankly, we can't wait. Need more pretty dresses in your life? Raquel Diniz will be your savior. This Brazilian designer knows how to flatter a woman's body with her elegant yet forward designs. Her dresses are meant to take you from day to night with ease. Another "easy" factor about Diniz? Even though the line is still gaining momentum it's currently available for purchase at Barneys NY, MatchesFashion, Moda Operandi, and Net-a-Poter. Happy shopping. Australian sunglasses brand Poms launched in 2011 and has continued to gain celebrity approvals from the likes of Beyoncé, Solange, FKA Twigs, and Cara Delevingne, just to name a few. We've seen some memorable styles from the label throughout the years, but its new "Ello" style has started bubbling up with influencers as of late, and we have a feeling more and more It girls will start wearing the brand well into 2018. Ukrainian brand Ienki Ienki just launched in 2016, and the puffer-concentrated label has truly blown up. Since its launch, not spotting an editor or fashion insider wearing one of Ienki Ienki's Michelin puffers would be a rare occurrence at best, but our goal today is to make the brand known to those of you who might not run in the puffer-obsessed fashion world. The Italian designers of Hebe Studio—Gea Antonini, Federica Croce, and Laura Zama—created the brand to prove traditional men's suits and tailoring can be modified to cater to a fun and elegant woman as well. It's no secret that these women know what they're doing after having done projects with designers like Valentino, Roberto Cavalli, and Vera Wang. Color is one of the most important qualities of the Hebe suit, which is why customers are given the option to customize their suits to fit their preferences. Owning one of these suits will surely have you feeling like a boss in no time. Classic shapes with a modern flare are exactly what you'll get when you glance through Marvais architectural handbags. Designed in Belgium by two best friends, Marie Libeert and Valérie Vanermen, these bags are intended for the woman who is looking to set trends and exude confidence, so we figured you guys should know about them. Founded by young designer Maya Reik, Marei 1998 is a brand that clearly exudes luxury, elegance, and utter sophistication. So far, you can shop faux-fur coats, glorious silk sets, slip dresses, and handbags that look as though they were passed down from your grandmother, and we mean that in a good way. Bella Hadid was recently spotted wearing a Marei 1998 faux-fur coats, so you know it's only a matter of time before the rest of the fashion world catches on. Gabi Gregg and Nicolette Mason, two of the industry's most well-known plus-size fashion bloggers, started this clothing line to feed an audience and a void in the marketplace. Premme is a brand for the curvy girl who has a vibrant personality and doesn't want to sacrifice style for size. In search of loud shoes that are still practical? Right this way. Nicole Saldana recently launched these snakeskin boots, and the influencer community is already going wild over them. We know how these things go—one cool girl wears something, then another, and pretty soon the whole fashion world is clamoring for anything from the brand. And luckily this time the hype is deserved. Established in 2017, Elza Wandler set out to design a collection of handbags that was feminine, modern, and dynamic, and that's exactly what she did. Now putting out four collections per year and being officially stocked at Net-a-Porter, Wandler is definitely one of the handbag brands to note this year, especially with the rise of belt-bags—one of our particular favorite styles from the brand.